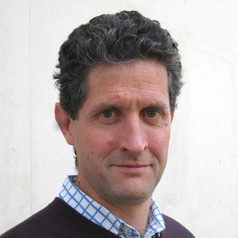 Myles Allen is Professor of Geosystem Science in the Environmental Change Institute, School of Geography and the Environment and Department of Physics, University of Oxford. His research focuses on how human and natural influences on climate contribute to observed climate change and risks of extreme weather and in quantifying their implications for long-range climate forecasts. He proposed the use of Probabilistic Event Attribution to quantify the contribution of human and other external influences on climate to specific individual weather events; the use of cumulative carbon dioxide emissions to predict peak warming; and leads the www.climateprediction.net project, using distributed computing to run the world’s largest ensemble climate modelling experiments. Research Cluster coordinator: Climate, School of Geography and the Environment. Principal Investigator, "www.climateprediction.net - distributed computing for global climate research", collaborative project (2000 present, overall budget c. £4m), performing large-scale Monte Carlo simulation of climate change using idle CPU on personal computers volunteered by the general public. Lead Author, "Detection of Climate Change and Attribution of Causes", Chapter 12 of the IPCC WG1 Third Assessment, 2001. Review Editor, "Global Climate Projections" Chapter 10 of the IPCC WG1 Fourth Assessment, 2007. Lead author, "Detection and Attribution of Climate Change: from Global to Regional", Chapter 10 of the IPCC WG1 Fifth Assessment, 2013. Coordinating Lead Author, "Context and Framing", Chapter 1 of the IPCC Special Report on 1.5°C, 2018. Member of the US NOAA/Dept of Energy International Advisory Group on the Detection and Attribution of Anthropogenic Climate Change.